It's nearly midnight here at the KISS station. The sun has finally set and twilight encompasses Kangerlussuaq. Still feeling the tail end of jet lag, we sit in the lounge downstairs sharing beers with fellow researchers and telling bad stories with good laughs. One thing I've always noticed in the field... there's not a person in the room--even in preparation before we leave--who doesn't love their job right now. Around breakfast the GEUS guys received good news from home... their polar suits finally (miraculously?) made it through customs in Copenhagen, and will arrive with us when Liam joins the team on Monday. Dodged a bullet there. We spent the morning concentrating on food. I'd shipped approximately half our food up from the States which we laid out in the NSF warehouse and combined with odds and ends left over in various boxes from last year's field campaign. I calculated we would need about 260 kg (~550 lb) food to survive on the ice. We were still short ~130 kg. Knowing how much to get is easy... with a million items laying around us, exactly "what to get" proves a harder question. After a round of musk-ox burgers at the airport cafeteria and a ridiculously expensive trip to the local supermarket, we spent the afternoon working the kinks out of our GPR (ground penetrating radar) system, inspected our snowmobiles, set up half the tents, and tracked down the rest of the inifinite minutia one might need for a month on the ice (second stove... more gear straps for the sleds... anyone have a DC plug to charge a 12V battery from a gas generator?). After a productive day in town we're feeling confident in our progress but still wearily aware of what's left to do before beginning our traverse. With only 1.5 days left, it'll be tight. 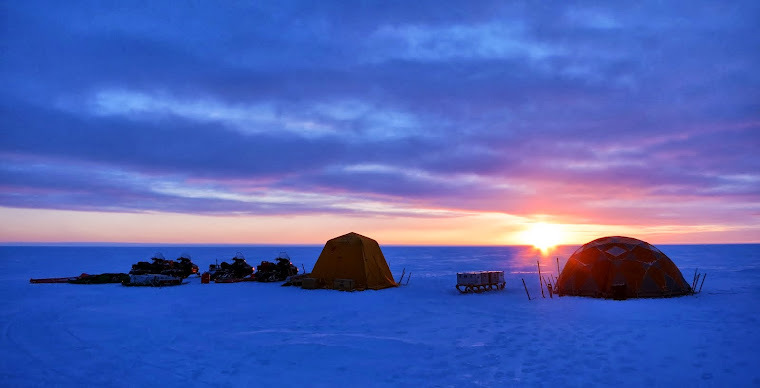 Tomorrow, a couple of the GEUS guys leave to maintain one of the lower weather stations in front of the Russell Glacier (KAN_B), and I'll spend my afternoon testing all my intstruments and Iridium transmitters to ensure everything survived shipping and still works. It really doesn't matter how much we prepare for a journey like this... in the end there's never quite enought time to get everything done. "Do the best you can" is a mantra every field member learns early to live with. Last sip for the night... most the team is off to bed already and I'd better follow if I'll be productve tomorrow. Good night from the Arctic Circle... the sun rises early again for us tomorrow!